Ani Calvo played in Jesuitinas Berrospe and won the Murcia Championship U14 and U16 while also playing with the Murcia Regional Team the Spanish European Championships U12, U14 and U16. In the 2011/12 season, Ani Calvo joined Siglo XXI and she improved year after year and averaged 13.9 points, 6.2 rebounds and +12.7 efficiency per game in Liga Femenina 2 during the 2013/14 season. Ani had great games against Campus Promete (23 points 10 rebounds +29 efficiency), Estudiantes (19 points 10 rebounds and 23 points 8 rebounds +27 efficiency) and Barça CBS (20 points +21 efficiency) and achieved with Siglo XXI the best results in the program history. During the 2013/14 season, Ani Calvo played with the U18 Spanish National Team and she was the best scorer in the friendly game against Germany with 18 points. In the 2014 summer, Ani played the U18 European Championship and she won the Bronze Medal with the Spanish National Team. Ani Calvo started her professional career during the 2014/15 season, after signing with Mann Filter Zaragoza and averaging 4.5 points and 1.4 rebounds in 14 minutes per game, shining against Gipuzkoa UPV (18 points), Gernika (17 points) and Conquero (13 points). After a 2015/16 season in which she did not have much oportunities at Mann Filter (2.2 points in 6 minuts per game), Ani Calvo signed with Uni Ferrol during the 2016/17 season and averaged 6.2 points and 2.6 rebounds per game, reaching the League and the Cup Semfinals and having good games against Zamarat (14 points +16 efficiency) and Gipuzkoa UPV (14 points, +19 efficiency). In the 2017/18 season, Ani Calvo re-signed with Uni Ferrol and she averaged 2.7 points and 1.6 rebounds in 15 minutes per game with 34.6% from the 3 point line, reaching the Spanish League Semifinals. 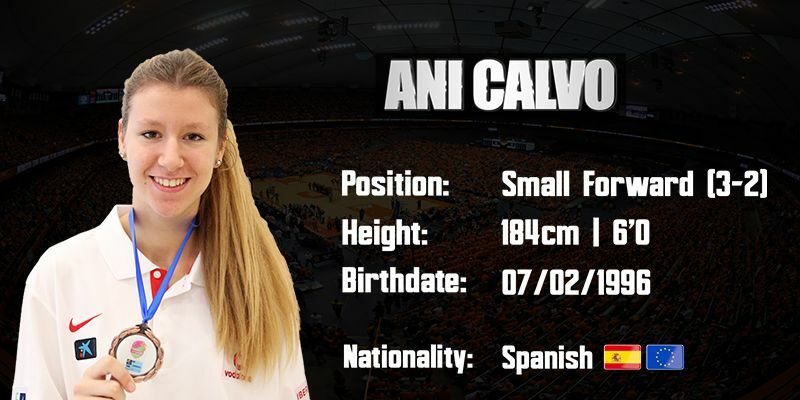 Ani Calvo is a 1.83m Spanish Small Forward born in 1996 who won the Bronze Medal in the U18 European Championship 2014 and who has experience in Liga Femenina and in Liga Femenina 2. Ani Calvo is a versatile player and a great 3 points shooter.